Wikipedia, the über-popular online encyclopedia, went down briefly today. It was unavailable for about 15 minutes, starting at 11:17 CET according to our Pingdom monitoring. 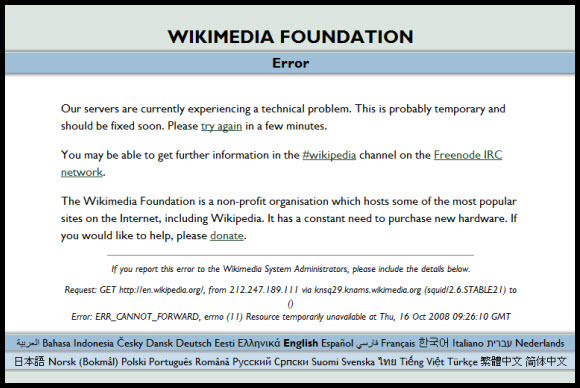 The service was responding with HTTP error 503 (service unavailable) and displayed an error page stating that the Wikimedia servers were experiencing a technical problem (screenshot below). Wikimedia.org was also down, indicating that Wikimedia had some form of general problem that likely affected all its websites, not just Wikipedia. It should be mentioned that Wikipedia has a very good availability overall, having only been offline for a total of about 1 hour and 30 minutes in the last six months. They have an uptime of 99.97%. # 09:19 JeLuF: deployed squid.conf with an error in it. All squid instances exited. # 09:22 – 09:52 mark, Tim, JeLuF: initial attempts to bring the squids back up failed due to incorrect permissions on the recreated swap logs. Most were back up by around 09:32, except newer knams and yaseo squids which were missing from the squids_global node group. The node group was updated and the remainder of the squids brought up around 09:52. Goes to show that human error is one of the most common causes of downtime.